Why wait? 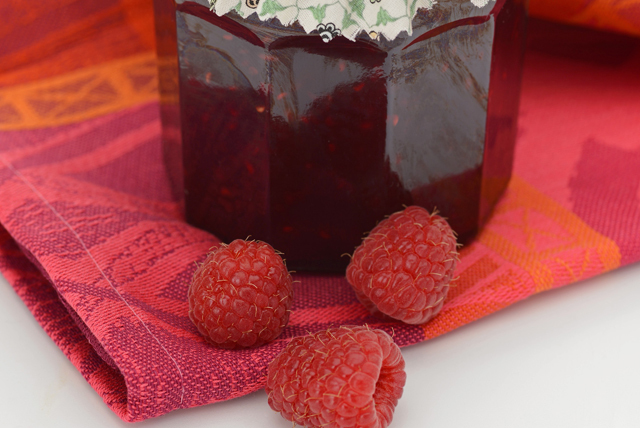 Try our CERTO recipe for raspberry jelly and enjoy it tomorrow. This is an easy way to make delicious raspberry jelly made with CERTO Pectin Crystals. Crush raspberries, one layer at a time. Place prepared raspberries in jelly bag; hang and let drip into bowl until dripping stops. Press bag gently to remove any remaining juices. Measure exactly 4 cups prepared juice into large saucepan. Stir in pectin. Bring to boil on high heat. Stir in sugar. Return to boil; cook 1 min. Remove from heat. Stir and skim 5 min. Pour into warm sterilized jars, filling up to 1/4 inch from rims. Cover with lids. Let stand at room temperature 24 hours or until set. Cooked jellies can be stored unopened on the shelf for up to 1 year. After opening, refrigerate and use within 3 weeks. To ensure accuracy of the sugar measure when preparing jellies, use a dry measuring cup to measure the sugar, then place all the measured sugar in a separate bowl before adding it to the juice mixture in saucepan. If you don't have a jelly bag, you can use cheesecloth instead. Stack 3 layers of cheesecloth, then moisten with water. Place prepared fruit on centre of cheesecloth, then gather cheesecloth at top and tie closed with kitchen string. Hang and let prepared fruit drip into bowl as directed.